More about the Claremont exhibit is here, with a calendar of events. 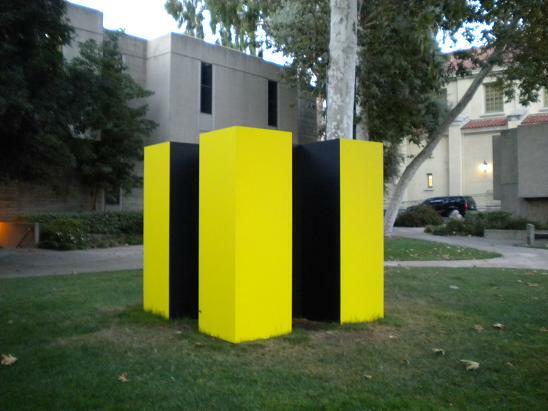 Below is alumni Chris Burden’s cube sculpture, which is installed outside the museum. Being an early-to-bed type, I visited the museum at 6:45 p.m. on a Wednesday with friends. If you visit the museum in the middle of the night, you can always mull over the show afterward at Norms, Claremont’s 24-hour diner. 1. Living in Arizona, I am absolutely counting on your coverage of “Pacific Standard Time.” No pressure though. I have been following this wistfully from afar for several weeks now and it sounds and looks incredible. 2. 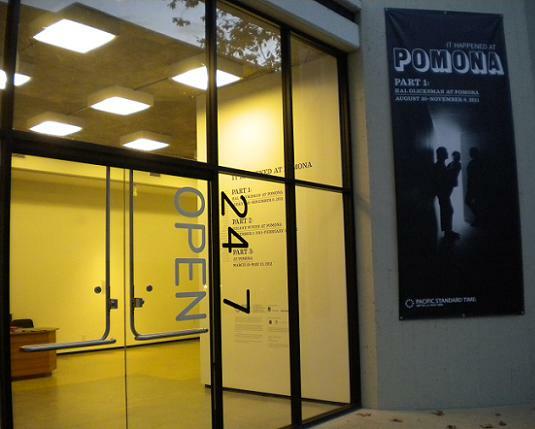 A hypothetical: If one were to park for the PC Museum of Art on College or Bonita at, say 1:00AM and spend a couple of hours looking at the exhibits, would one then find an infamous Claremont “overnight parking” ticket on one’s car? Speaking of 7-Eleven’s being open 24/7, I remember someone mentioning that if they are open round the clock 365 days a year, why then do they have locks on their doors? Denny’s across the street from Norm’s has been around for much longer, and probably was Claremont’s original 24 hour diner – except it’s Denny’s, and so no one cares.